Recently I presented two Lights of the Lakes shows. The first was on September 16th for around 20 members of the Milwaukee Sail & Power Squadron. The venue was Saz’s State House in Milwaukee. The second show was on September 23rd at Newcastle Place in Mequon, WI. I had an attentive and appreciative audience of 45 folks for this presentation. 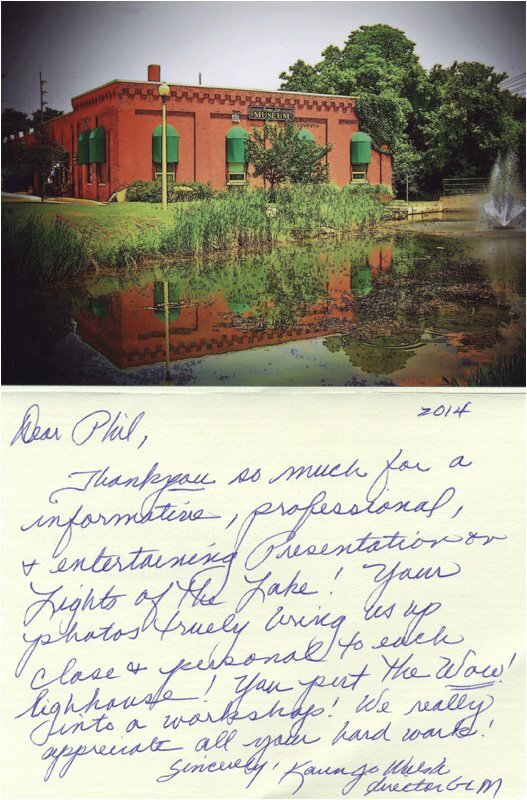 Recently received this nice note from the Geneva Lake Museum thanking me for presenting Lights of the Lakes as part of their “Tuesdays at Two” workshop series. Thank you for an informative, professional, and entertaining presentation, Lights of the Lakes. Your photos truly bring us up close and personal to each lighthouse! You put the Wow! into a workshop! We really appreciate all your hard work!